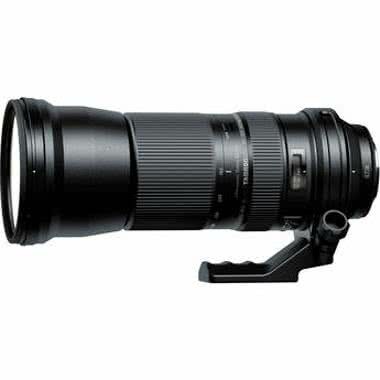 The Tamron SP 150-600mm f/5.6-6.3 Di USD Lens for Sony A Mount is a versatile telephoto lens designed for both full frame and crop frame sensor DSLR cameras. The 4x zoom covers standard to super telephoto range and a full rotating and removable tripod collar. The Ultrasonic Silent Drive autofocus is quick and precise. The quiet operation of the lens is suitable for wildlife and even videography. The linear pattern zoom and focus rings are comfortable to work with. Lens groups are specifically designed to minimize excessive movement and helps keep the lens relatively lightweight. This lens is suited for sports shooting, wildlife/nature photography, and field events. • Compatible with both full frame and crop frame sensor Sony A mount DSLR cameras. • Not compatible with the Sony a7/a7R/a7S Mirrorless Cameras without the Sony Alpha LA-EA4 Camera Mount Adapter, or a similar adapter.